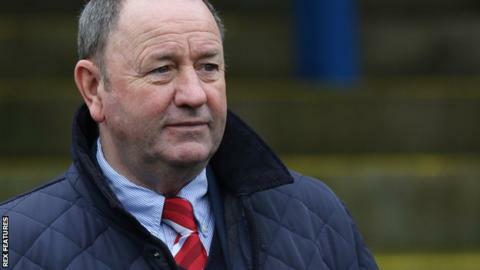 Cheltenham stayed top of the National League as they extended their unbeaten league run to 19 games with a comfortable 2-0 win over lowly Welling. Danny Wright headed the Robins into a 17th-minute lead with his 16th league goal of the season. Dan Holman then got his 17th of the campaign six minutes into the second half as he calmly slotted home. Welling, without a league win since October, rarely threatened as they remained in relegation trouble. "His ankle's come up a little bit and when your ankle comes up it looks like ligament damage, otherwise it doesn't blow up. "But we've got a good medical team and we've just bought a new machine that helps you recover from ankle injuries - the minute we get an ankle machine that helps, we get an ankle problem! "We don't know how long it'll be yet, let's hope it's not long-term, but he's going to be out for a couple of weeks at least." Match ends, Cheltenham Town 2, Welling United 0. Second Half ends, Cheltenham Town 2, Welling United 0. Foul by Ade Yusuff (Welling United). Attempt saved. Ade Yusuff (Welling United) right footed shot from outside the box is saved. Attempt missed. Dan Holman (Cheltenham Town) right footed shot from outside the box misses to the right. Substitution, Cheltenham Town. Billy Waters replaces Harry Pell because of an injury. Substitution, Welling United. Luke Wanadio replaces Kadell Daniel. Substitution, Welling United. Ade Yusuff replaces Nortei Nortey. Substitution, Welling United. Reece Harris replaces Michael Bakare. Goal! Cheltenham Town 2, Welling United 0. Dan Holman (Cheltenham Town) right footed shot from the right side of the six yard box to the centre of the goal. Assisted by Daniel Wright. Second Half begins Cheltenham Town 1, Welling United 0. First Half ends, Cheltenham Town 1, Welling United 0. Attempt missed. Kadell Daniel (Welling United) header from the right side of the box misses to the right. Assisted by Noah Chesmain with a cross. Attempt saved. Jack Barthram (Cheltenham Town) right footed shot from the right side of the box is saved. Attempt saved. James Dayton (Cheltenham Town) left footed shot from outside the box is saved.